The ‘Deprecated notice’ is because the access to the Topsy API (which is used to extract Twitter activity) is now behind a developer key. A post from Alan Levine (@cogdog) on Syndication Machines (plus syndication of syndication) which details how feeds for the cMOOC course ds106 are aggregated and resyndicated got me thinking if there was additional data around student blog posts that could be usefully captured. 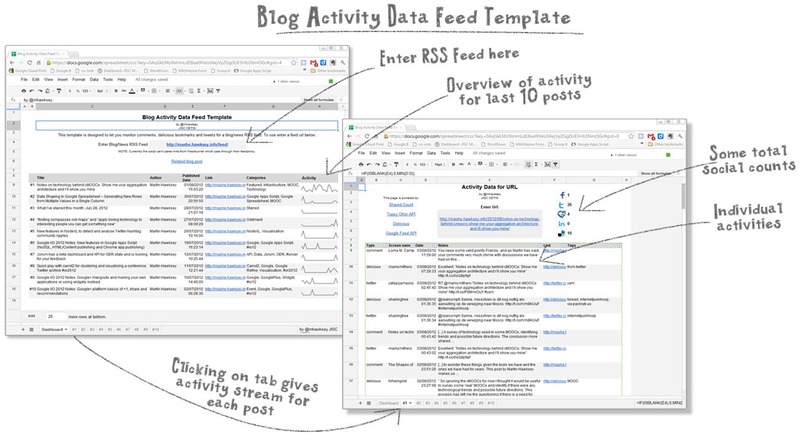 Previously for something like that I would have turned to PostRank Analytics, which allowed you to specify any rss feed and it would aggregate social activity like tweets, bookmarks from a wide range of services and let you see it all in one place. Unfortunately PostRank were bought by Google and while some of this data is now accessible from Google Analytics it’s restricted to your account and data from social networks Google isn’t directly competing with. 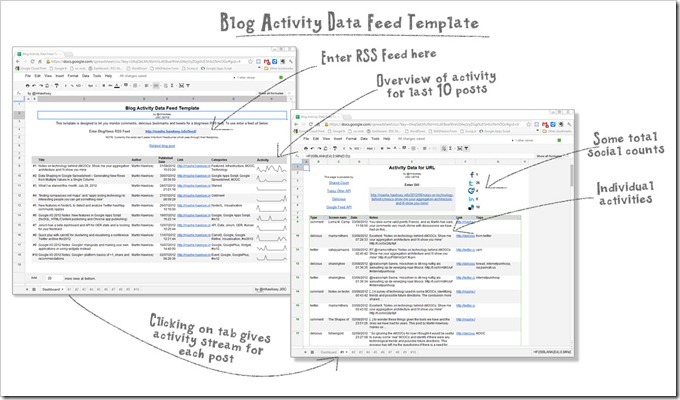 You can make as many copies of the template as you like to track other RSS feeds. 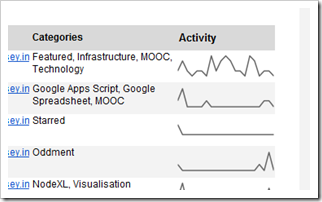 There are a couple of cool things under-the-hood for the Activity Data template worth noting. So far I’ve limited the template to sources that have easy access. Previously if an API disappeared, changed or I discover another service I would have to modify the template and users would have to make a fresh copy. With Managed Libraries the Google Spreadsheet template now only needs 11 lines of code (shown below) for 3 custom formulas (see cells Dashboard!C8, and #n!G2 and #n!B8). Because the template uses my own socialActivity library and because I’ve left the template in Development Mode when I update the code changes should (I hope) filter to all the existing templates in use. This means if I can add more services with open APIs details should start appearing on the post activity pages (denoted with # at the beginning). If you were wondering how I did the activity sparklines, here’s how. Sparklines are a built-in Google Spreadsheet formula (here’s the reference). To get them to work you need some data if you want some options. For the data all you need is an array of values and sparkline will plot them equally spaced. In this use case I’ve got comments, tweets, and bookmarks with date/times. To plot the sparkline I need to know how many of these were made between specific time periods. Another function we can use to get this data is FREQUENCY. This lets us specify some intervals and source data and returns an array of the frequency of data points. One issue is that for each post the activity range varies, so one post might only have activity in July, and another in August. There are other formula (MIN/MAX) to get the range values. Here’s how the final solution was pieced together. Hopefully you’ll enjoy and if you can think of any improvements or other services to tap into just get in touch.